Snakebite present major challenges to companies working in rural and far remote areas. Pakistan is facing severe energy crisis and maximum of its oil and gas reserves are from Khyber Pakhtunkhawa, Balouchistan & Sindh. The Exploration and Production (E&P) Companies have to cover miles for search of these resources and where they found some potential, they set up their temporary living camp and might stay there for as little as 2 months or as long as 1 year in search of oil and/or gas reserves. Over the past half century the petroleum industry has played a significant role in national development by making large indigenous oil and gas discoveries. These sources are supplying oil + gas to consumption centers through 10000 Kms (approx.) transmission networks and 71,863 Kms of distribution system. This led to millions of man-hours spent in the most difficult terrains throughout Pakistan and snakebite is one of the most likely and biggest threat having severe consequences to the industry workforce. Snakes are remarkable animals, successful on land (on-shore) and sea (off-shore), forest, grassland, lakes, and desert. E&P Companies are going in search of oil and gas reserves (believe me they don’t follow snakes around their facilities) but the snakes do like their company so they can find something fresh and new to eat. We are scared of them and they too are scared of us but our quest of oil & gas reserves and their to food help us to find each other most often. Bites by venomous snakes result in a wide range of effects, from simple puncture wounds to life threatening illness and death. The biggest threat faced by E&P Companies is in search of reserves they have to live in far remote areas and survive with limited resources. A snakebite case is the one having fatal outcomes if gets delayed treatment. The journey wastes precious time to reach a suitable facility to get that treatment and many victims die during the journey (as the victim has no anti venom to rapidly neutralize the venom and no airway equipment to ensure they keep breathing during the journey and to deal with complications at local clinic etc etc). 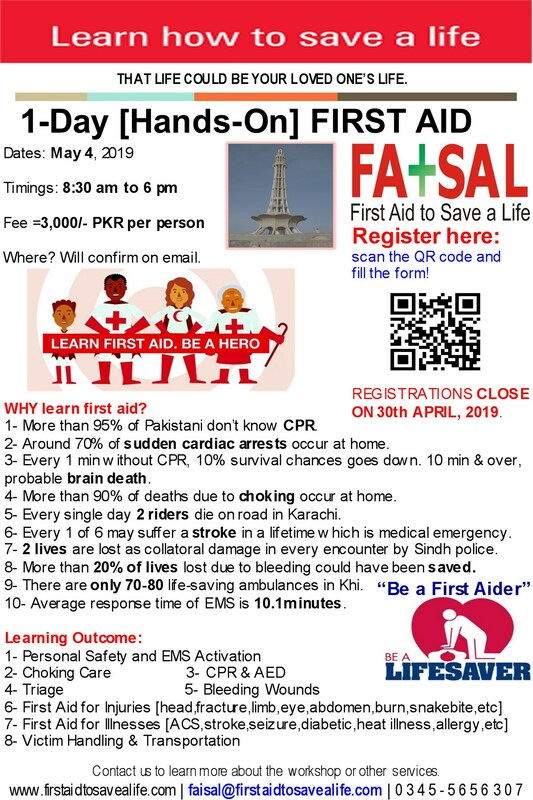 First Aid to Save a Life (FATSAL) Pakistan in their next post will share what you can do to overcome this most high rank threat so we stay safe, works better, earn better and contribute our skills to help our country find more and more reserves and grow on strong lines. This entry was posted in Advanced First Aid, emergency care and first aid, Emergency First Aid, Project Diary, Why choose First Aid to Save a Life and tagged anti snake venom vials and pressure bandage, anti-snake venom vials, are snakes cold blooded, cardiotoxin type of snake venom, categories of snake venoms, cobera, cobra belongs to which snake family, cold-blooded snakes, control of bleeding in snakebites, cytotoxins type of snake venom, deadly snakes in sind, deadly snakes in sindh, deadly snakes of sind area, fatalities from snakebites in baluchistan, fatalities from snakebites in exploration and production companies, fatalities from snakebites in gilgit baltistan, fatalities from snakebites in kashmir, fatalities from snakebites in khybar pakhtunkhawa, fatalities from snakebites in nwfp, fatalities from snakebites in oil and gas companies, fatalities from snakebites in oil and gas sector of pakistan, fatalities from snakebites in pakistan, fatalities from snakebites in punjab, fatalities from snakebites in sindh, fatalities from snakebites while at work, first aid to snakebite, first aid to snakebites, hematoxin type of snake venom, how many types of snake families exists, how snakes inject their venom, how snakes inject their venom when they bite, how to treat snakebites at remote locations, krait, krait belongs to which snake family, loundy snake, lundy, national institute of health, national institute of health pakistan, neurotoxin type of snake venom, poisonous snakes, pressure bandage and application of ANV, pressure bandages and snakebite, russel viper, russel viper belongs to which snake family, sari south block and types of snakes, saw scaled viper belongs to which snake family, snakebite, snakebite and use of anti venom vials, snakebite and use of tourniquit, snakebite cure, snakebite management, snakebites and control of bleeding, snakebites and first aid, snakebites and its first aid, species of poisonous snakes, species of poisonous snakes in balouchistan, species of poisonous snakes in gilgit baltistan, species of poisonous snakes in jamshoroo, species of poisonous snakes in karachi, species of poisonous snakes in kashimir, species of poisonous snakes in khybar pakhtunkhawa, species of poisonous snakes in nwfp, species of poisonous snakes in pakistan, species of poisonous snakes in pakistani deserts, species of poisonous snakes in punjab, species of poisonous snakes in sindh, tourniquit and snakebite, types of poisonous snakes in pakistan, types of snakes in jamshoroo, types of snakes in karachi, types of snakes in sindh. Bookmark the permalink.